Notions from Natalie: She's Here! 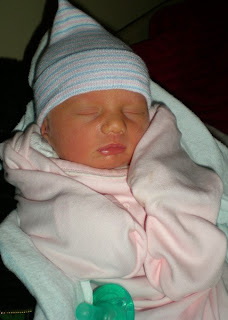 Cecilia Elise Adkinson arrived on Wednesday, April 9, 2008 at 6:31am. She weighed 6lbs and 1oz and was 19 inches at birth. Everyone is home now and is trying to adjust to life as a new family. Cecilia has had some problems maintaining her temperature, eating and she has jaundice. As of today, the home health nurse is encouraged (her name is Nurse Ceci by the way-really-she has the same name!). Today, Ceci's billirubin count has gone down by 2 points and is now at 12.6. She also gained an ounce-weighing in at 5 lbs 8 ozs! We have seen the pediatrician everyday but today and we are supposed to go back to see her tomorrow at 8:30am. Ceci is also starting to eat a little better, which is encouraging. We are having to feed her every 2 hours-we set alarms to stay on schedule. She has also taken her first bottles of breastmilk. We found out at 3am this morning that even the newborn bottles give her too much milk at once, so Papa Vaughan rescued us by getting Preemie Bottles from BabiesRus. She took to it like a champ-he got to do the first feeding by the new bottles! We are all tired and are looking forward to Ceci not having to sleep on the Billibed any more. She looks so uncomfortable and has made it clear to us that she doesn't like being constricted in her pod (she looks like a glow worm baby all zipped up on the light bed). She has improved her temperature as well and has not gone under 97.2 degrees in the past 2 days. We are trying to be encouraged. Say your prayers for us b/c this is definitly stressful. I will try to upload pictures in the next day or so. I know that there are many who are looking forward to seeing them. For now, I will just add this one. More later! Congratulations Natalie! She is beautiful. Congratulations! I'm so happy for y'all! I hope things will calm down this next week! Oh, Natalie, she's beautiful! (And she's here!!) Thanks for posting an update-I'm praying for you all. Natalie, She is beautiful. Just pretend the lights are grow lights since she is so petite. I know you are so excited to have her home. I am so very happy for your sweet family. Love to all.